I inadvertently had one of the most easily mapped apartments on the planet when I lived in Santa Monica. All I needed to tell people was that my building “backed up to Bay Cities,” and immediately almost anyone from the greater Los Angeles area knew exactly where I resided. 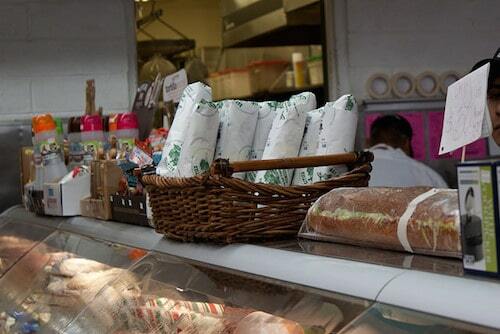 Bay Cities Italian Deli and Bakery is a Santa Monica institution that has been around since 1925. Though the small market is full of gourmet goodies, it’s by far the most famous for the sandwiches that come from its deli counter. 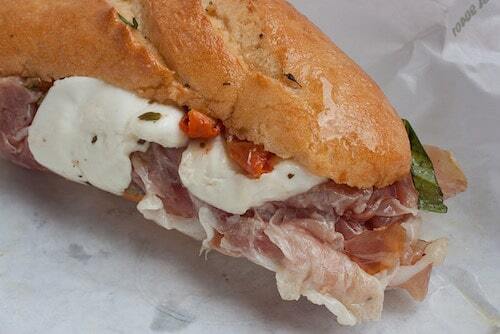 And of its lengthy sandwich list, Bay Cities is by far the most famous for The Godmother. The Godmother is a pile of Genoa salami, mortadella, coppacola, ham, and prosciutto with provolone cheese on Bay Cities’ own baked-fresh Italian roll. There’s no question that you should order it with “The Works,” which adds mayo, mustard, onions, pickles, tomatoes, lettuce, Italian dressing, and pepper salad (hot or mild, depending on personal preference, and you can go wrong with neither). It’s less a sandwich and more a gooey, drippy, delicious experience—you’ll burn through a whole pile of thin napkins as the sandwich innards try to make their escape. But the necessary death grip on the whole shebang just ensures that the ingredients all fuse for maximum impact once they reach your mouth. If multiple Italian meats aren’t your jam, there is still plenty else to tempt you. 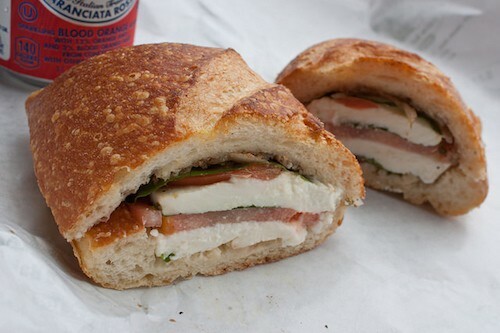 Bay Cities has a huge array of sandwiches, including my other personal favorite, the Caprese, made with super fresh mozzarella, tomatoes, and basil. It hits all the spots if you eat it at a table outside as soon as you’ve ordered it, but it’s almost even better if you delay gratification by, say, picking up sandwiches and then drive to the Rose Bowl to tailgate for a UCLA football game. The olive oil and balsamic vinegar really start to soak into the mozzarella and tomatoes, and while this sounds like it would mean a soggy sandwich, the bread is so hearty that it still holds up but with a divine meld of flavors. Or one can always just cut to the chase and buy a still-warm loaf of bread along with some cheese and olives from their expansive selection of both and go to town. I’m not going to say that my best friend and I have put away an entire loaf of bread in an afternoon… but I’m not going to say that we haven’t, either. Paired with a bottle of wine from the market, and a dish of oil and vinegar on the side for dipping? Perfection. The overcrowded, small-spaced parking lot can be intimidating, but a security guard is always on hand to try and help manage the chaos. The aisle by the deli case is always packed roughly four people deep, but the staff are pros and can turn out sandwiches at an awe-inspiring rate. When you arrive and pull a number, you might be alarmed to realize there are 25 people in line ahead of you, but it will go quickly. Or you can order online and then just waltz in and pick up your sandwich already made, along with any extra meats, cheeses, or salads from the deli that can be ordered at the same time. If you, say, live across the alley from Bay Cities, then this is like magic. I no longer live in that apartment—sad for me, as I am not within drooling distance of the sandwiches, and even sadder for all of my friends who would use my parking space off the alley if they stopped by for a weekday sandwich while I was at work. (I know full well that my popularity was directly related to my proximity to the deli.) Probably good for my waistline, though, given those warm, crunchy-on-the-outside-chewy-on-the-inside loaves of fresh bread available all day long. 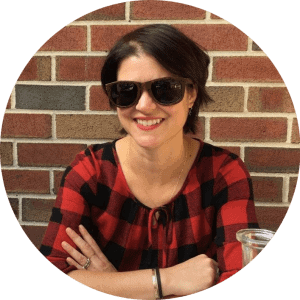 Lauren Shotwell is a writer, cat lady, and sandwich and Mexican food enthusiast who currently lives in Los Angeles. She has also written for Television Without Pity and Previously.TV.